I’ve known Fishé online for ages and since he sent me this album via courier I’ve had it on constant replays on my playlist. Fishé (Pronounced FEE-SHAY) whose real name is Andrew Mosheshe was born over 25 years ago in the small German county of Fulda; raised in Warri a town in his home country of Nigeria and now living in the United States since 2004. Fishé, the son of a doctor and a teacher, who read English and Literary Studies from Delta State University Abraka, can thus be rightfully said to transcend continental boundaries. 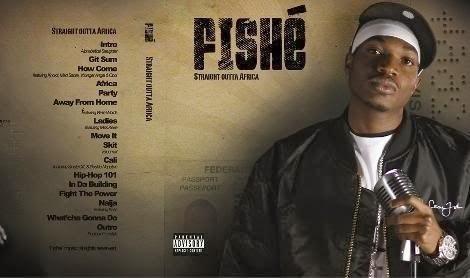 Armed with a unique and instantly identifiable Nigerian accent, and not phased by his botched one year deal with L.A based indie label Random Records Inc. on which he released his 2005 six track “Moment of Truth” E.P, Fishé is out with his follow up: "Straight Outta Africa"! Production: Don Perinion, Knoxz, RoTone, Hendog, Peter Lindahl, Alexis Isbell, the Apprentice and Tone.E.See. Guest appearances: Paige Rasmussen, Miss Keke, Sinister XL, Double Negative, Write Words, Kess, Knoxz, Mad Sabre, Younger Angel, Oboi and Nat Kendall. Favourite tracks: my favourite track on the album is unarguably “”africa”. I also feel “what cha gonna do” and “move it” big time. On the title track “africa”, we’re led on a musical journey to the acknowledgement of the beauty that is the continent of Africa to dispelling the false notion of Africa only being a backward entity to reiterating the wrongs that were the days of early western colonization and the slave markets that came with it. At the end of the song we get to hear the name drop of great African/black leaders and heroes that’ll undoubtedly instill pride in any listening African ear and unbridled admiration from non-Africans. “what cha gonna do” is basically an expression of Fishé bragging right as one of the best Nigerian rappers in diaspora. Starting with a typical Nigerian chant and drum beat the songs is lovely all through and can’t fail to get one dancing lightly. “move it” has the melodic Paige Rasmussen on the hook a partnership which also worked well on “africa”. It’s a typical bounceable song, with lyrics to boost the artiste’s ego and beats to get people moving it on the dance floor. Criticism: The much I can say is that the album becomes really nice after frequent listens but it could be better so as to make it an instant attraction. If it had more Nigerian flavour it’ll be sure to do better in the Nigerian market. Fishé’s flow is very tight, and his straight Nigerian accent is actually a very good and unique thing considering that we’re in a world of fakers. All in all I’m moved to agree with him that he’s one of the best on display and every line he spits makes me wanna press on replay. I also guess I agree with the album’s official release statement: “"straight outta africa" comprises the original essence of Hip-Hop’s foundation, from the super-lyrical, to using it as an ample tool for the spread of knowledge and awareness, to just something to have fun with and vibe to in the clubs or in the comfort of your home or ride.” The diversity of this work is set on display with UK Grime track “how come” to the G-Funk sound of the track “cali”. You can also get that Southern Crunk flavor from the track “ladies”, a dose of Afro Hip Hop on the song “naija” as well as the regular east coast feel and an occasional flash of dancehall raga. This variety with a spice of everything else and laced with a couple of conscious joints stems from the use of producers from all across the regions of the United States to the shores of the U.K to Nigeria itself. Note: This post is used for the purpose of cultivating interest in the featured musician. It is more of a promotional tool rather than an illegal file sharing means. However, if you are an artist or a label represented here and you would like your music removed let me know and it will come down immediately. nice one, my first spanish comment. so babelfish.altavista.com tells me that means: "That title page seems of a tape instead of CD! lol"
well efremigio the picture is only a part of the casing not the whole thing...lol. Hustles are many, stories aplenty!